How often do people think about it? What are the biggest causes? Can we solve this problem? Don’t buy it? Make it better. In our analysis, we take a deeper look at our survey results and highlight the patterns and insights we find under the surface using segmentation across meaningful demographics (like age, gender, and location). Homelessness is a horrible experience for anyone. Living day to day without stable housing, income, and/or basic necessities is a nightmare. As housing prices increase in much of Idaho, getting out of homelessness becomes even harder. What can we do about it? 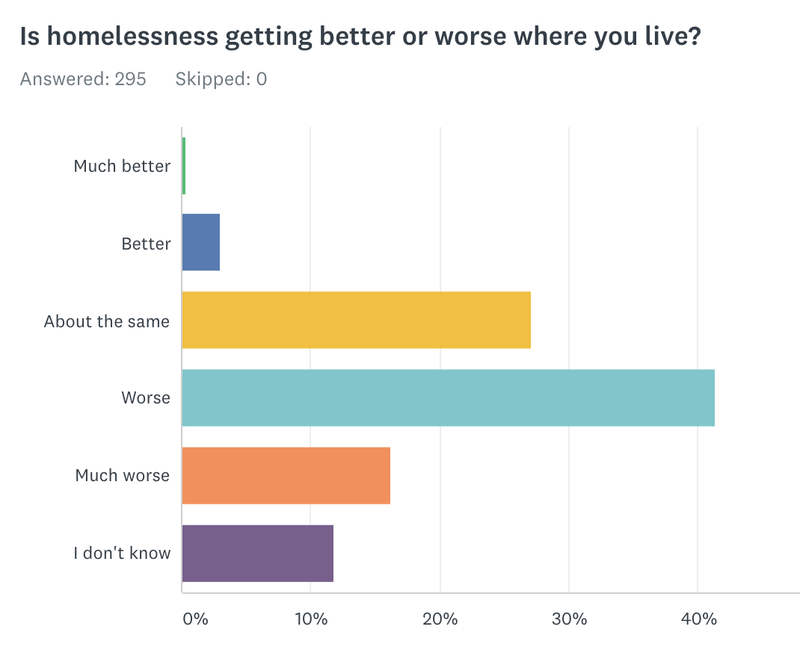 We wanted to know what people think about homelessness where they live. Here are our questions and results, and below’s what I found most interesting. 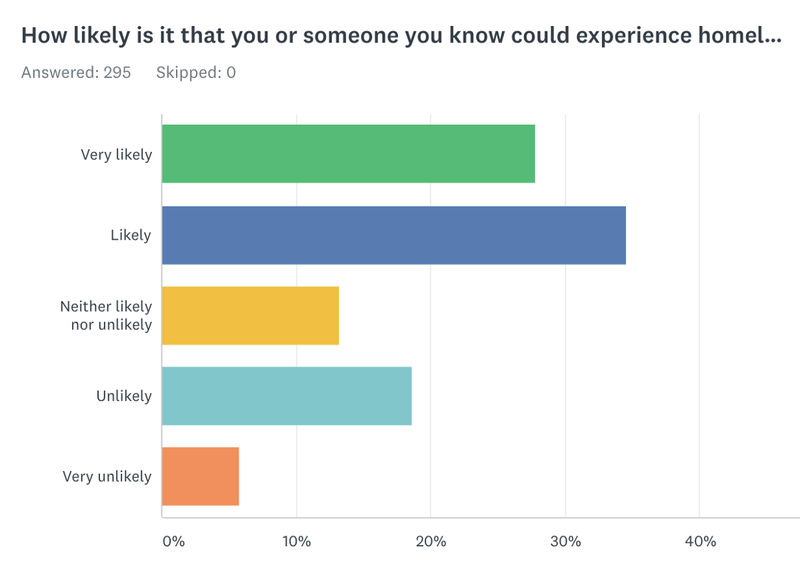 First off, we had TONS of first-time respondents! That’s fantastic!! I’m really excited they contributed. The only downside of that is that we don’t have survey history for these folks, so we’re not able to pull in demographics from other surveys. That’s why the gray bars on gender and age are so high. Keeping this in mind, I’m not sure what the gender or age breakdowns are, but we’re pretty distributed among the people that we’re sure about. 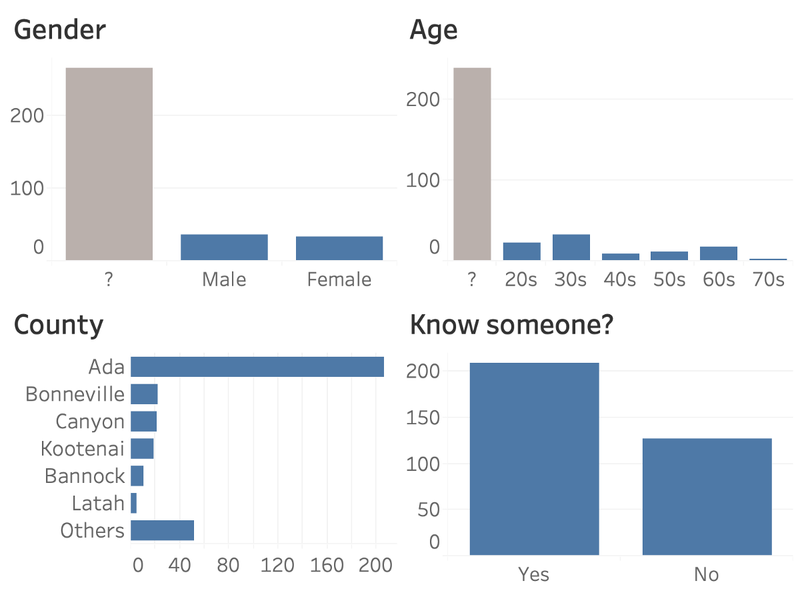 As for location, our biggest group of respondents were from Ada county, but about 40% of responses came from elsewhere. And I think most importantly, it’s good to know what degree of experience people have with homelessness. About 60% of our respondents have known someone that has experienced homelessness before. We’re going to use this last question for most of our segmentation in this analysis. Let’s start with some perspective. 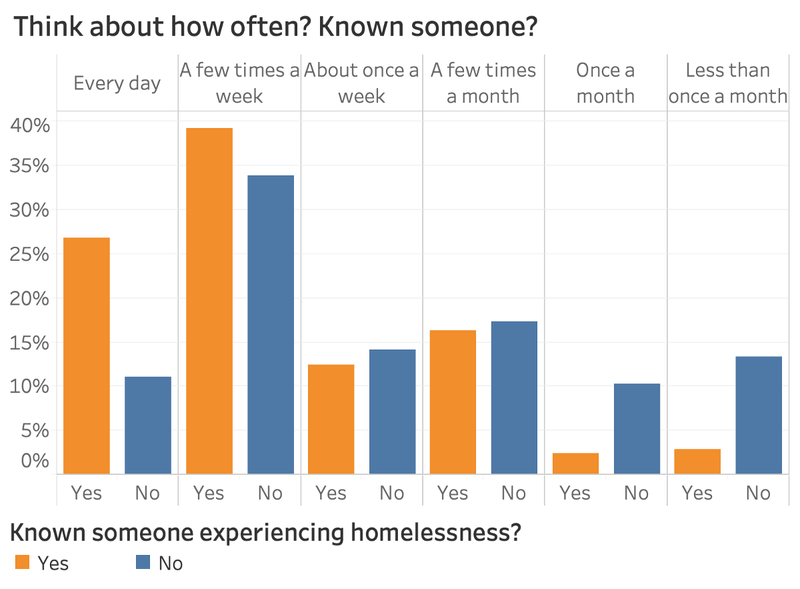 Before we go into other specifics, I thought it’d be helpful to know how often homelessness is on people’s minds. This helps us gauge whether it’s something that people think about rarely or regularly. That would flavor how I interpret the other answers. 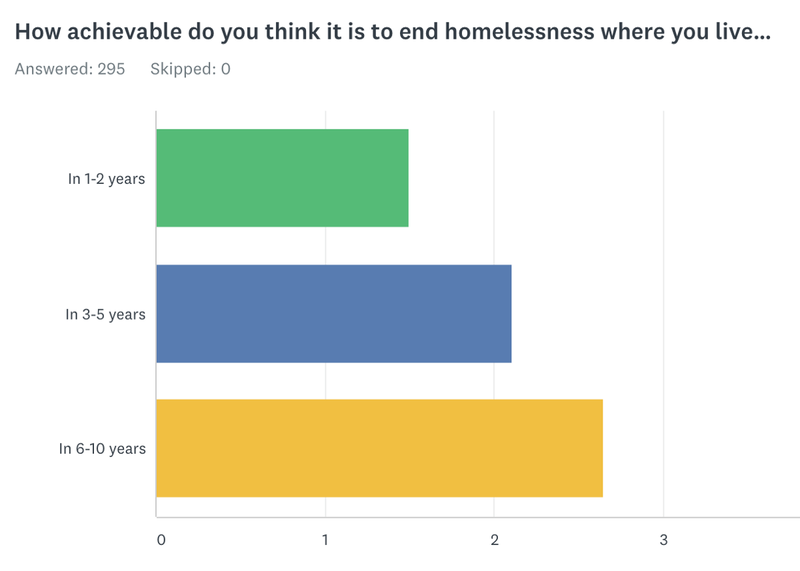 Our overall results show us that about 70% of our respondents said they think about homelessness at least once a week. Wow! That’s higher than I expected. And there’s only about 10% that think about it as rarely as once a month or less. Definitely seems like an important issue for our respondents. Let’s dig a little deeper. 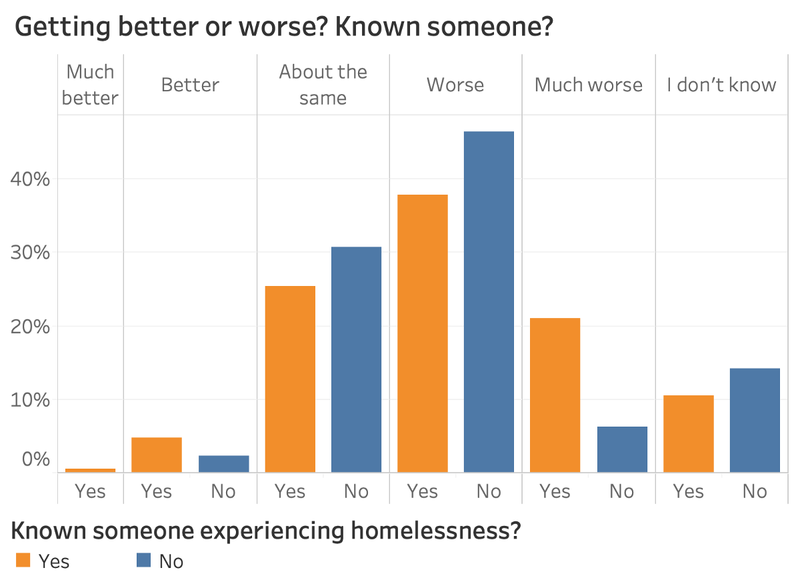 I wanted to know whether people that have known someone that’s experienced homelessness think about it more often. I would guess that they do, since they’ve have personal experience with it. Remember, 60% of our survey respondents have known someone (above). And that’s right! 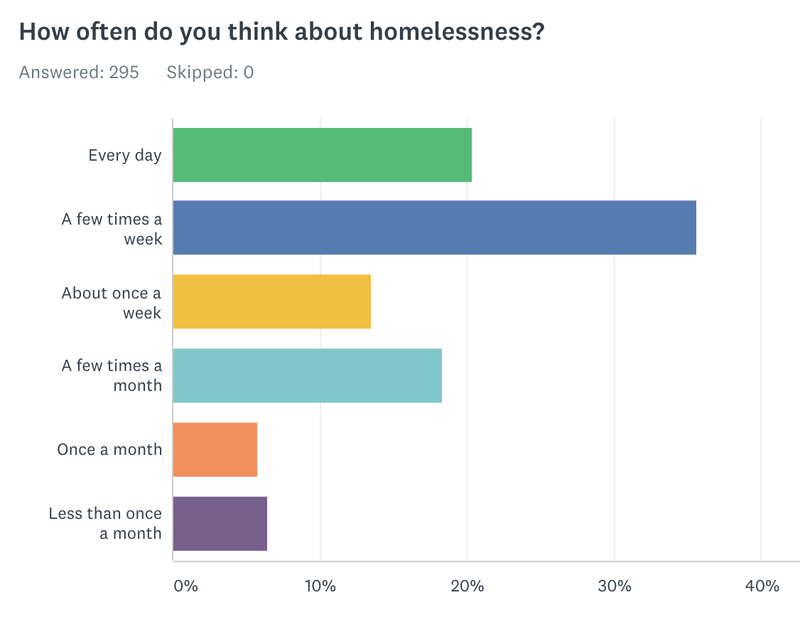 Our respondents that have known someone experiencing homelessness answered that they think about it “Every day” twice as often as those that haven’t. If you compare weekly frequency, about 75% people that have known someone think about it that often, compared to about 60% of the other group. Makes sense to me — it’s probably much more real to you if you’ve known someone facing these challenges. And now I’m curious what image of homelessness is in people’s minds when they’re thinking about it. We asked which “image best represents homelessness in your mind” to get at this. And the most common response (of the options we provided) was “an adult male.” That’s not really surprising to me either — I think that’s typically the generalization people have. The interesting thing to me was the difference in choices between people that have known someone before or not. Those that have known someone picked adult male much less and “A family” twice as much. From the news stories I’ve seen, I think that’s more common than many people realize. Next up, let’s see what people thought about how “significant” this problem is. Or, how bad it is. The overall results of that survey question showed that the most common answer was “somewhat significant. However, there was a bigger group that thought it’s “more than somewhat” (45%) than those that thought it’s “less than somewhat” (20%). Ok, seems like most people are thinking this is a pretty urgent or noteworthy problem. Is that different if you’ve known someone experiencing homelessness before? Definitely is. 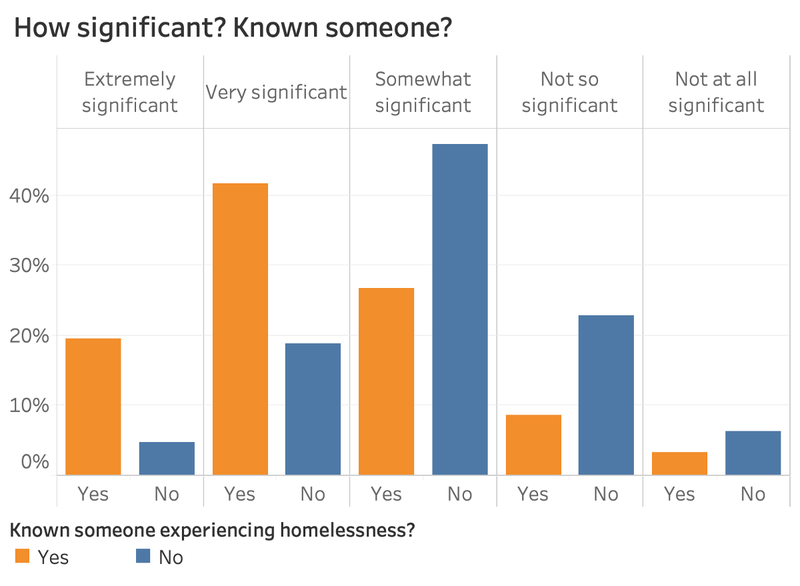 60% of people indicated that homelessness is more than “somewhat significant,” if they’ve known someone, compared to only 25% if you haven’t. Whoa! That’s a pretty crazy difference. It totally makes sense to me though —again, if you’ve known someone, this is very real for you. You might have seen their pain and challenges first hand, and it’s no longer theoretical in your mind. Next, I wanted to know whether people think this could happen to them (or someone they know). Given that so many of our respondents already know someone, I would expect this to be high. And it is. 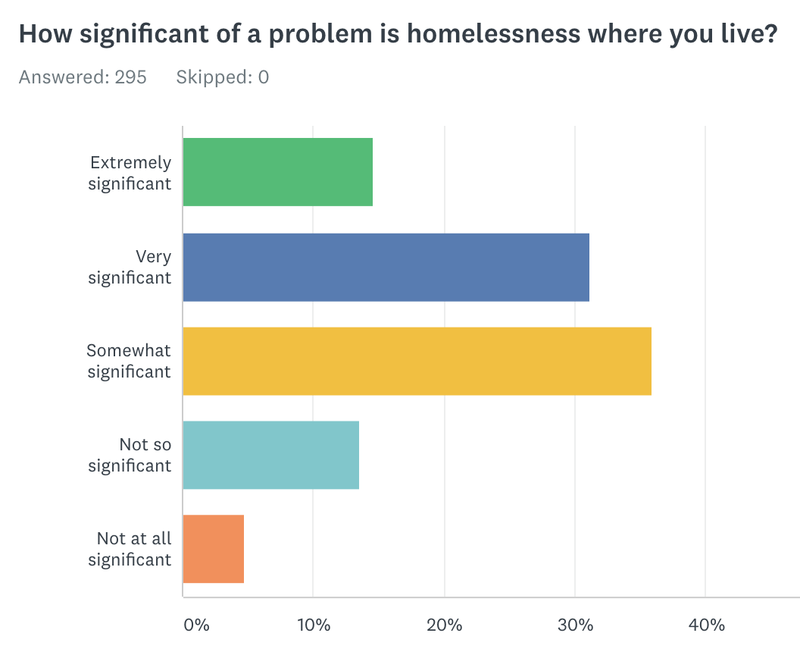 About 60% of our respondents said it’s likely or very likely that they or someone they know could experience homelessness. That number kind of blows my mind — I personally answered “Neither likely nor unlikely,” and it makes me realize how privileged my situation is. 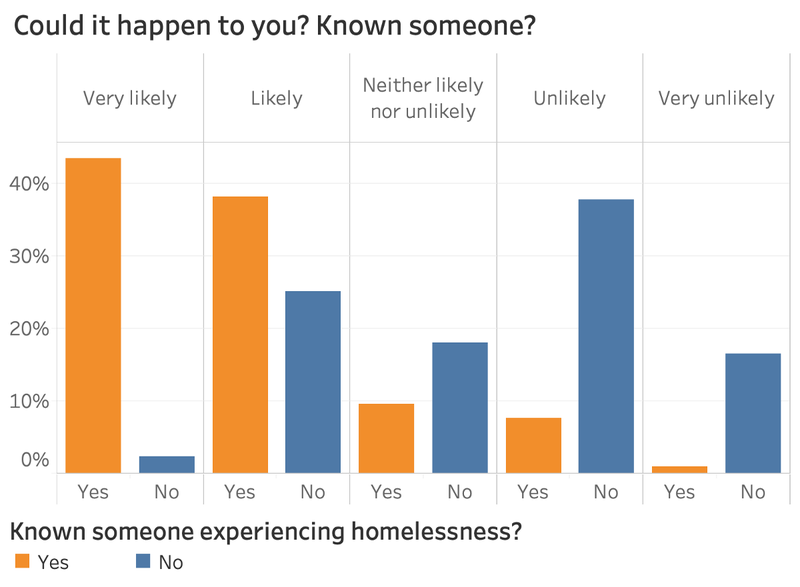 Probably the most interesting thing about this angle is that 25% said that they think it’s likely they or someone they know will experience homelessness, even though they don’t already know someone. I think that’s an indication that people realize an unfortunate series of events could push them into this situation. That’s backed up by many of the open-ended comments also. Don’t forget to check out that section at the bottom! Ok, we already know a lot, but now let’s look at our last “context-focused” question: is it getting better or worse? This is an important factor, because people might agree it’s a terrible problem but might have really different perceptions if they think things are going in the right direction versus not. Overall, virtually no one thinks they’re getting better. About 25% said they’re staying the same, and 10% said they’re not sure, but a whopping 65% said they think homelessness is getting worse. Yikes! That’s bad. But with the way housing prices have been going, it’s not hard to believe. Let’s go back to my favorite slicer on this. Do you answer differently if you personally have known someone that was homeless? Actually, not really. Doesn’t look to be much divergence here — both groups’ answers are pretty close together. 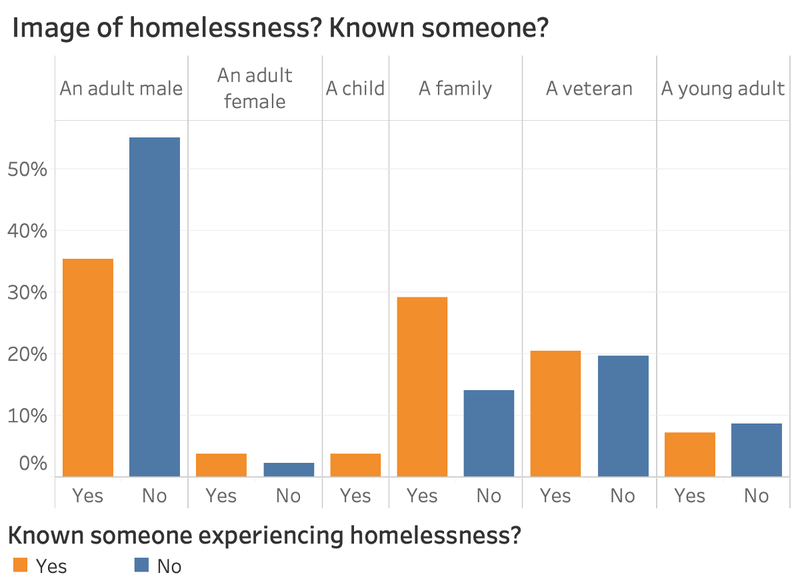 If anything’s surprising, I would have expected less people that have known someone experiencing homelessness to answer “I don’t know” — there was slightly less, but not by much. We’re going to shift gears away from context now and start to think about causes and solutions. I think the most core question to ask with this is whether you think homelessness is a choice or not. The way you feel about this probably determines what you think the right solutions are. Overall, most of our respondents think it’s not a choice, and many of them “strongly” disagree with that statement. Reading between the lines, they must think people often end up in this horrible situation because of forces beyond their control. That was also indicated by a lot of open-ended comments. And what do people that have known someone think? 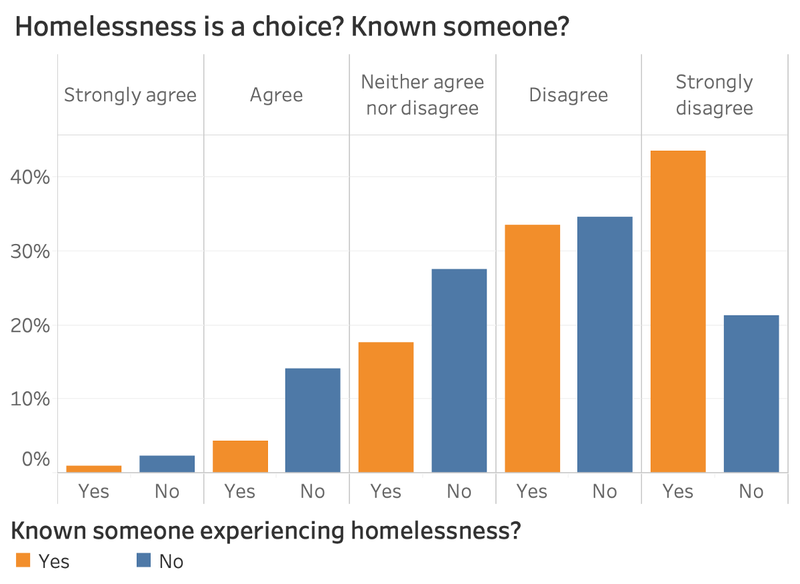 Well, they were twice as likely to “strongly disagree.” I think the interpretation here is that if you have personal experience with homelessness, you think it’s not that simple — it’s mostly not a choice. Sure, choices are a part of everything, but it’s not something you can get yourself out of at the snap of a finger. Now that we’ve talked about whether it’s a choice, we’ve got a good foundation for thinking about causes. I think they’re probably very connected — if you think it’s a choice, you might be more likely to blame homelessness on being a criminal, being poorly educated, or having a bad work ethic. 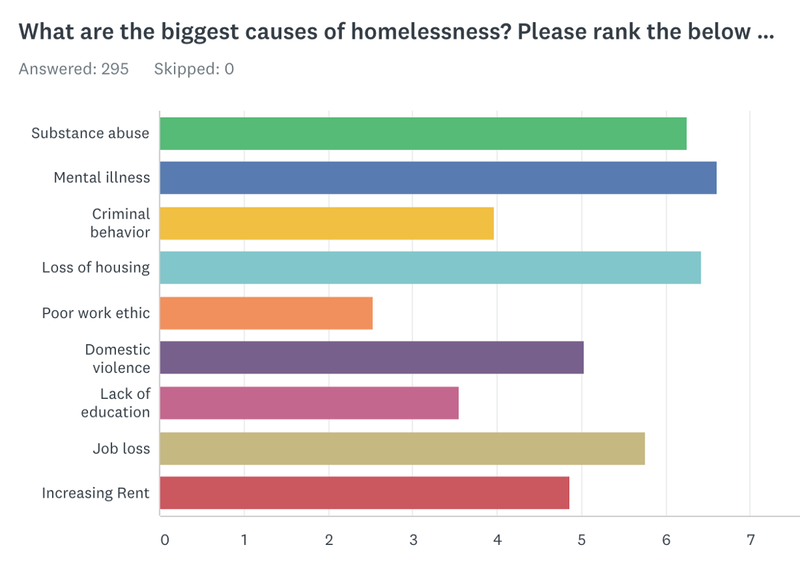 Overall, the highest prioritized causes (in the list of options provided) were “mental illness,” “loss of housing,” and “substance abuse.” And the rest weren’t really that close. Seems like there’s some consensus here. The least prioritized cause was “poor work ethic.” That definitely makes sense to me, given how many people said they don’t think homelessness is a choice. Another question we asked focused on whether any behavior or characteristics should disqualify you from receiving community housing services. 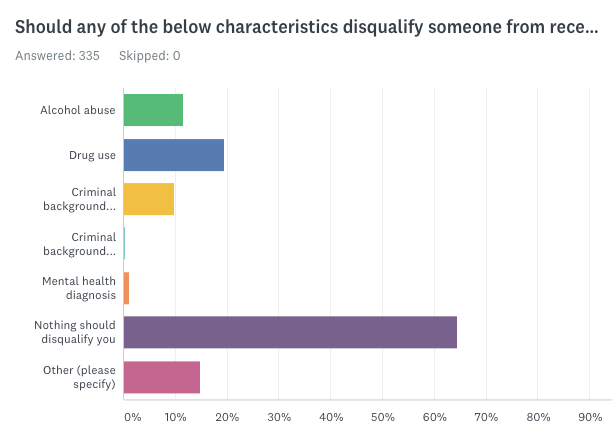 Overall, 65% of people said “Nothing should disqualify you.” And 10–20% of folks said things like alcohol abuse, drug use, or past felonies should disqualify you. One thing to note is that a pretty big group wrote in “Other” answers (~15%). Most of those seemed to involve risk of violence of some kind and were considering the safety of neighbors and the nearby community. Some other comments mentioned that if you refuse to work if you’re able, that should disqualify you. With all this in mind, how optimistic are we? 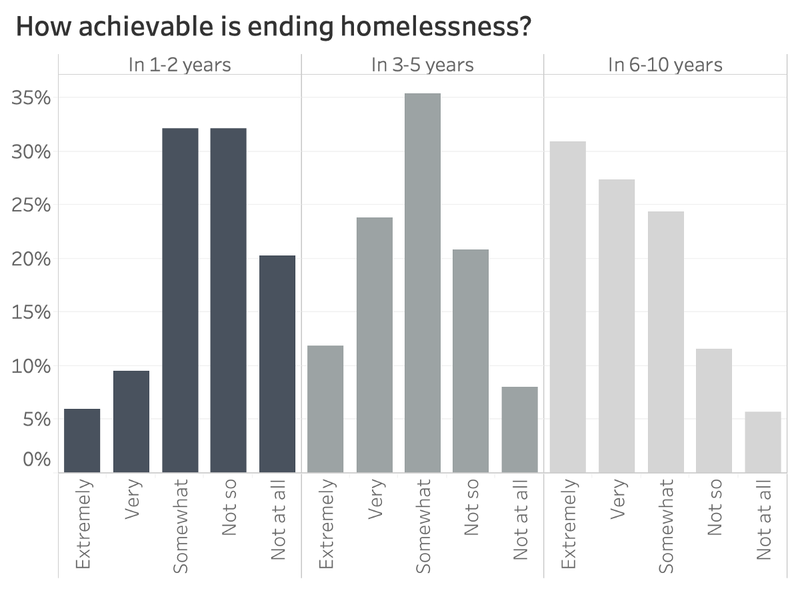 We asked about how “achievable” ending homelessness is where you live, in a couple different periods of time: 1–2 years, 3–5 years, and 6–10 years. Overall, people definitely got more optimistic about things being achievable further out in the future — that’s visible in Survey Monkey’s default weighted average chart. But I wanted to know how the specific answers broke down. On the other hand, I thought it was interesting how many people thought it’s “Not at all” achievable, and how that changed across the time frames. Actually, the proportion of that group didn’t change much between the 3–5 years and 6–10 years options. 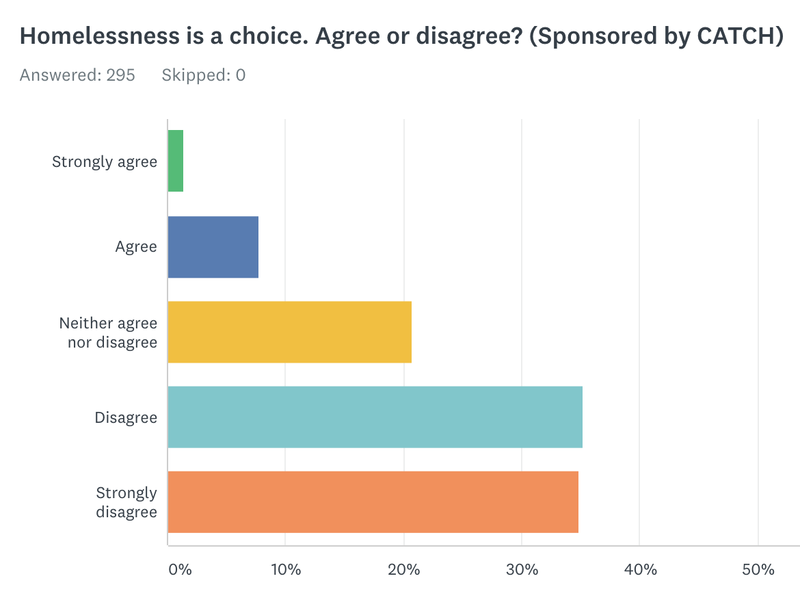 I’m guessing they’re the people that think homelessness is a choice—from that perspective, if people are choosing this, maybe it’s a human nature situation, which isn’t easy to change. And lastly, I wanted to check my favorite slice on this topic. 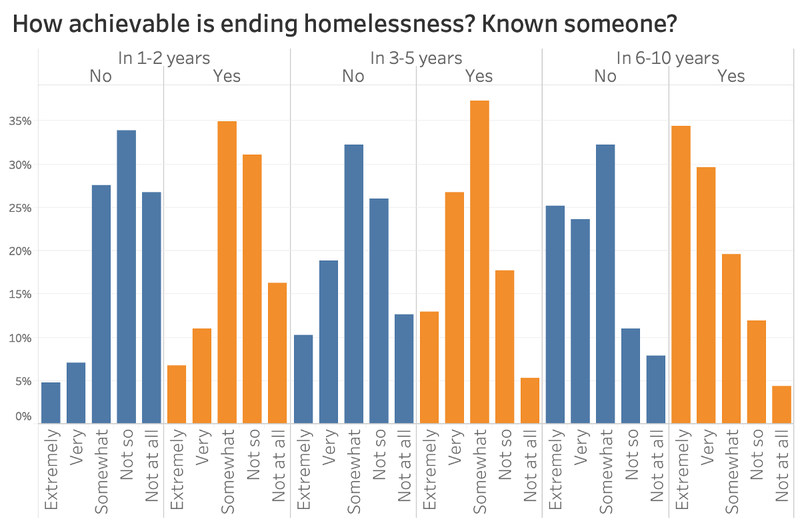 It looks to me like people that have known someone that’s experienced homelessness are generally more optimistic about ending it being achievable — in each category, the orange bars lean a bit more to the left (more achievable) than the right (less). That seems like a good thing! I’m guessing the people that have direct experience with homelessness have a better idea what the right solutions might be. So, if they’re more optimistic than the people that haven’t experienced it, then that seems positive. That’s all for quantitative analysis. Now we’re going to shift gears to qualitative, and see what interesting comments came through. Lots of interesting comments, as usual. I’ve highlighted several that I think are particularly thought-provoking or representative, and I’ve bolded key phrases to help you skim. What gets too much attention? The cost of housing. It is high, but having spoken with a higher than average number of people affected by homelessness, substance abuse, state involvement with their family, criminal histories, and more importantly recovery, it has far less to do with housing and and more to do with choices and priorities. Myths about people making $40k a year begging, and the idea that anyone would choose to live on the street out of laziness. The stereotyping that occurs about people experiencing homelessness. It’s not just drugs and apathy. So many folks in our society are just barely hanging on. Even some of you reading this. How many of you have more than three months worth of savings available? If something happened, an injury or family emergency, and you couldn’t collect income, how long before your resources ran out? Mine certainly wouldn’t last long. And our country has stripped away many of the protections that keep people afloat when that life-changing event does happen. Blaming/ Shaming people who find themselves in these very hard positions. They may be ineffectively coping with mental illness/ substance abuse but that doesn’t mean they shouldn’t have a stable place to live. You can’t get better without stability. Anti-hospitability measures, anti-panhandling measures. These shift populations and treat symptoms, but do absolutely nothing to help the people affected. The myth that all homeless people are drug addicts that don’t want to work. Not a lot of people are aware that there’s working people that are homeless and people that are mentally impaired that are homeless as well. Drugged up tent cities that are harmful for respectable people. Homelessness — period. We have more beds than people so we don’t have a homeless problem. The issues run much deeper. Also, most street corner beggars have homes so quit giving them money! People have a not in my backyard mentality. Fact is anyone can become homeless at any time. People assume that all homeless people are psycho drug addicts. That’s not true. Not every homeless person is an alcoholic, drug addict, psycho, unemployed, lazy loser. People focus on drugs and alcohol too much when it comes to homelessness. I don’t think that most people that talk about homelessness have ever seen someone that is truly starving. Boise Rescue Mission programs, without addressing their discriminatory housing policies specifically aimed at LGBTQIA folks and people who do not practice Christian religions. How people think Boise is turning into a Seattle or a San Francisco. The idea that people will flock to the area if we start giving people housing. People begging for money with their signs. Unfortunately, many of them just want a quick buck, which makes it harder for those that truly need help to get any. Plus that’s just another example of literally throwing money at a problem instead of really trying to fix it. Sometimes too much focus is given to the faux homeless who abuse generosity of strangers. I’ve seen people write off homelessness as a cause deserving of attention after feeling manipulated/ tricked. I understand this response, but making generalizations about the homeless population based being lazy or sneaky based on a bad experience with a panhandler is unfair to the thousands of homeless people in need of help who just quietly try to get by. What doesn’t get enough attention? High rent, job loss, families with children. We need to end the stigma of the homeless person being a drug using, mentally ill criminal. Homelessness has a face and its families with children, especially in Canyon County. I think there needs to be better education about causes of homelessness and more information as to the most effective way to address/ help fix homelessness. I think a lot of people spend time arguing about whether it is helpful or hurtful to give cash to people panhandling on street corners. I have given out cash on occasion, but I don’t usually feel all that much better after doing so, perhaps because I don’t think it’s an effective way of addressing the systemic nature of homelessness. I’d like to see more research and fact-based PSAs regarding effective ways to help the homeless on a grander scale. That being said — while it is important to look at the big picture and root causes and solutions to homelessness — it is also important to remember that the homeless population is made of individuals, and a little compassion can go a long way in the way we think about the issues around homelessness. Additionally, I think people need to have a more flexible idea of what being homeless can mean. I think when many people think of homelessness they imagine the chronically homeless (that’s what I most immediately think of), but temporary homelessness is a serious issue as well, and is (sometimes) easier to hide, so I think it gets less attention. Finally, homelessness is a complex problem. There is no easy solution. I struggled to fill out this survey with yes/ no answers because I have very nuanced views on the subject. The children affected. People see young men/women living under bridges and don’t see the children squirreled away in acquaintances homes, the grand parents raising their grandchildren, the siblings split up from each other. It becomes generational…. “cheaper housing” isn’t going to fix that. Veterans being homeless should never happen. They served our country and need help no matter what it takes. The fact that many choose to stay homeless, on the street and don’t utilize the beds available because of religious restrictions or mandatory “Bedtimes” or even sobriety. If a drunk atheist needs a bed at 11pm..we should be able to find a way to provide that. I think at the root of much homelessness is mental illness. That’s the reason for the substance abuse, the inability to function in the workplace, the social isolation, etc. Everyone is 2 bad luck occurrences away from homelessness. Also, lack of a permanent residence that is not a PO box is a huge problem. You have to have an address to get ID, a job, aid, library card, etc. We have enough houses to eradicate homelessness, but the government is too selfish to care. Profit over people is more important to them. Capitalism increases homelessness and poverty. That hardworking people get down on their luck and end up in situations that they would have never imagined. It could happen to anyone. Families that are homeless. I was homeless once with my children due to domestic issues/mental illness. I worry about them being warm and having enough to eat. I know there are soup kitchens and things but do they always know how many will show up to eat. I also believe that there are other people who take advantage of the services that are offered to the homeless when they don’t need them. The families and the runaway children hardly ever get mentioned unless it’s a political thing. Most people assume if your homeless your worthless, a drunk or a drug addict. They never realize many times people simply can’t afford a home no matter how hard they work. They like to blame the runaway children but anyone who has ever been on the streets can tell you, if life on the street is preferable to home, there is something terribly wrong at home. Predatory and greedy landlords. The near absence of affordable housing. Excessive cost of rent, application fees, etc. Most everything. Sleeping outside in freezing cold, nowhere to go, limited non- religious based services, etc. it’s maddening how little our community cares about the homeless. Success stories. People lifting themselves out of poverty is very inspiring to hear and can help improve the public’s view of the homeless. The people, especially in poorer Idaho counties, who have their electricity turned off every summer because they are behind on payments from last winter. Homelessness is very close for a lot of families, but we all want to believe it could never happen to someone we know or in our neighborhood. Housing First like New Path. This is a single site housing first project, I would like to know more about scattered site housing first projects or locations. That families experience homelessness, by no moral fault of their own, laziness is never a cause of homelessness. That systems can be hard to navigate, making folks less likely to reach out for help. That there is homelessness in our community and that the people experiencing it are not in any way different from me or you. Homelessness can both be a cause for things like unemployment and a barrier to finding employment. If more members of our community knew homeless people or worked with them, I do think some of those negative perceptions could evolve. The inequality of rich versus those who cannot afford basic necessities. A small portion of the population owns the majority of housing in our state, but do not set prices of living to a standard where the majority of the population can live. This causes thousands of vacant houses with thousands of homeless. I think those of us that live paycheck-to-paycheck on Section 8 and are disabled or over 62 we’re just a month away from homelessness and life is very stressful. It’s like waiting for your fire to burn out hoping to stay warm after that happens. Living in fear of loss is sometimes overwhelming. It could literally happen to any of us. We could lose a job or have a medical emergency that bankrupts us and causes us to lose our homes. It’s not just people who are mentally ill or who have other severe life circumstances who become homeless and we should be more sensitive to it. The root cause…why and what we can do. Boise needs to not invest in a Library and spend time on a day time Homeless Shelter. Bieter wants to have a legacy. What about humanitarian??? My kids are fearful at the downtown Library do to homeless people. Let’s spend money on Shelters, training, mental help, family centers and housing. Don’t waste money on the Library!!! How we could be one of the first communities to solve their problem ENTIRELY through housing first. I truly believe that there should be housing for everyone. There are always going to be a percentage of the population that can not take care of their housing needs for various reasons. I also feel that it could happen to anyone! I would like to think that if I found myself in this position I would have a place to turn that is clean, safe, non judgmental and supportive. For example, a complex of small apartments that meet basic needs and has full time security on the premises. Or how about a complex of the same that is built near a police station and a community center? A place with tons of community support so residents have easy access to mental and physical health care, job training, drug and alcohol treatment & childcare. The families that are creating a generation of homelessness. My family has volunteered for 13 years feeding the homeless on Sundays. A big part of homelessness is a choice, we see over 50% of the men, women, and children have been coming for years. We see it generationally now. They know they can work but this is their life, this is their identity. Also a big reason a lot of the people we meet are homeless is they burn bridges with their family’s or the family’s burn bridges with them. There’s nowhere for them to go because of grudges or arguments forwards friends. Family that could open their arms to these people in their time of need. The effects of NIMBY on housing availability and affordability. See the Barber Valley and downtown neighborhoods rage against density/affordable housing in their communities this year. The Barber Valley development went from 100 apartments/30 townhomes to 30 $400k-$900k single family homes because of the NIMBY efforts of Barber Valley and Warm Springs residents. Then a downtown church wants to use extra land it has to build affordable housing and its community flips out. That’s all folks! If you want more analysis goodness, check out our other posts here. We’re working to figure out what people really think. If you ever read our stuff and don’t believe the results, you could be right — maybe we aren’t hearing from enough people with different views.